Snailing on the Hill. Courtesy of artist’s website. Jae Yong Kim has made a name for himself with his humorous, pop-art inspired ceramic creations. This December, the Art Alliance is pleased to present Kim’s installation, Donut Craze. Consisting of dozens of individually crafted ceramic donuts, Donut Craze explores issues of consumption, globalism, mass production, and pleasure through the lens of the humble glazed donut. Currently based in New York City, Kim grew up in Seoul, South Korea, and has travelled extensively. Much of his earlier work revolved around the notion of home as, in his words, “a verb rather than a noun.” Before creating his donuts, Kim used cartoon-like snails to express his ideas about home and belonging. These slow-moving creatures literally carry their homes on their backs, so home is wherever they happen to be. Similarly, Kim has spoken of his own sense of home as a sense of constant movement and, most importantly, creative work. To make is to be at home, wherever in the world the artist finds himself. Donut worry be happy. 2013-2015. Ceramic, under glaze, luster glaze, Swarovski crystals, mixe media. Courtesy of Artsy. Closely associated with American popular culture that has spread its franchises across the globe, the donut speaks to the rootless globalized world of production and consumption. Rather than offering us an overt critique of this reality, Kim’s work conveys an almost child-like joy and pleasure. His glazed donuts look good enough to eat, and viewers can’t help but smile at their bright colours and sometimes humorous shapes. Kim has said that he targets his work at young people, aiming “to make them happy.” Kim’s artistic process is also guided by the principle of pleasure: he works with each individual donut until he is happy with it, a process which takes three or four firings in the kiln over the course of many days. We might even think of the kiln as being like a baker’s oven, and indeed Kim has organized his studio to look like a bakery, with trays full of glazed donuts. Donut Madness, detail. 2013. Ceramic, luster glaze, glaze, Swarovski crystals. Courtesy of Ferrin Contemporary. Despite their mass-produced appearance, each of Kim’s donuts is individually crafted in his workshop. The layers of glaze are meticulously applied, sometimes playfully alluding to the work of artists like Jackson Pollock, Claes Oldenburg, and Yayoi Kusama. Some of the donuts are shaped like Mickey Mouse heads, tempting the viewer to bite off an ear. Our consumer culture is made literal here, but it is also frustrated, because we can’t actually eat Kim’s ceramic donuts. After our initial delight at these whimsical donuts, we start to ask questions about production and consumption in a globalized world. Can we really just take uncomplicated pleasure in these donuts, or should we instead be asking, who is consuming whom? Donut Craze will be on view from December 10, 2015 to January 3, 2016. The Art Alliance is open Tuesday through Sunday, 12 to 7 pm. Closed on Mondays. Text by Flora Ward, Intern. Categories: Art, Craft, Exhibitions, Uncategorized | Permalink. Philadelphia-based artist Dona Dalton makes serious toys. Her hand-crafted wooden objects blur the line between toys and sculpture, and ask us to take play seriously. These hand-painted pieces have the charm of old-fashioned wooden toys, whimsical animals on wheels, with articulable limbs. Dalton works with pine and poplar wood, using a bandsaw, a sander, a rotary carver, and a drill. The child-like naiveté of her work is combined with close observation and careful depiction of animals, as well as unusual imagery drawn from Egyptian mythology. Dalton has written that her goal is “to capture the gesture, personality, and something of the spirit” of the creatures she carves, transforming them into animate “companions” for your home or office space. Come by the Art Alliance’s pop-up shop, Geppetto, and find your own carved wooden companion! Kingfishers: Cerebus Dwarf, American Pygmy, Ruddy, Malachite. From the artist’s website. Many of Dalton’s pieces are inspired by the close observation of animal behavior, including her series of birds. Each bird seems full of life and personality, conveyed by subtle details of body language. Brilliantly colored kingfishers perched on painted wheels seem to converse, their long beaks extended eagerly to chat with their fellows. The subtle carving of their bodies suggests feathers, catching the light and appearing to flutter. Plump Carolina wrens huddle together conspiratorially, their ruddy coloring contrasting to the brilliantly colored wheels. Their unlikely wheels ground Dalton’s birds, transforming them into humorous hybrids similar to those found in the pages of medieval manuscripts. Carolina Wrens. From the artist’s website. Sekhmet, Nut and Anubis. From the artist’s website. Seth, Horus, and the Eye of Horus. From the artist’s website. Some of Dalton’s work is inspired by her study of Egyptian mythology. Dalton depicts gods and goddesses from the Egyptian pantheon, such as Horus, Seth, and Anubis, in the flattened, two-dimensional manner characteristic of Egyptian art, but they all sport unlikely wheels. In addition to single pieces, Dalton also makes ensembles, rather like dollhouses. In her piece, Things To Do, that most Egyptian of buildings, the pyramid, is transformed into a funerary dollhouse, complete with everything needed for the afterlife, including food, furniture, servants and, of course, the mummy itself. Things to Do Pyramid. From the artist’s website. The Art Alliance is pleased to present Dona Dalton’s work as part of its holiday pop-up market, Geppetto. Geppetto will be open Tuesday through Sunday, 12 to 7 pm from December 10, 2015, to January 3, 2016. Please note that the Art Alliance is closed on Mondays. Categories: Art, Artist Profile, Craft, Exhibitions | Tags: Philadelphia Art Alliance, rittenhouse shopping | Permalink. Boise Doily. 100% cotton (commercially dyed), blocked and starched. 2014. Courtesy of artist’s website. HomeWork, guest curated by Alex Stadler, explores the themes of femininity, domesticity, and textile-based craft through the idiosyncratic work of two contemporary Philadelphia-based artists, Erin Endicott and Asimina Chremos. Chremos is an unconventional combination of dancer and crochet artist. She uses both these art forms to experiment with improvisation and free-flowing movement, be it of bodies or of thread. Chremos uses a traditional craft in non-traditional ways, eschewing patterns and predictability to create doilies unlike any you have ever seen. Chremos learned to crochet from her two grandmothers, one Greek and the other American. Her use of this traditional technique evokes the generations of women whose textile crafts have long been excluded from the rarefied world of Art. Originally a private dwelling and now a public institution dedicated to the display of contemporary craft and design, the Art Alliance is both a domestic interior and an exhibition space, making it a particularly evocative venue for Chremos’ work. Chremos plays with asymmetry and color, the forms of her work arising from the process of making rather than from a predetermined pattern. 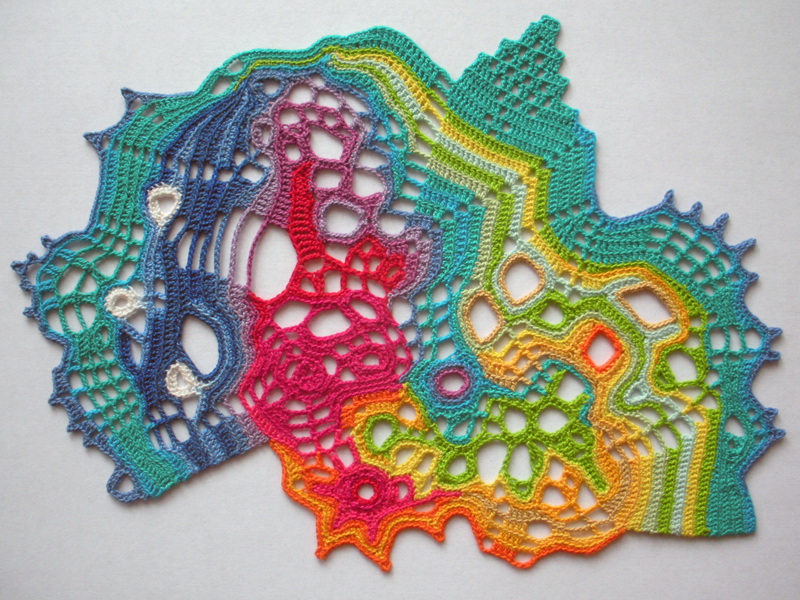 Her crocheted doilies call to mind the slowly shifting forms of clouds or the changing colors of the evening sky. These organic forms are the result of the improvisational nature of Chremos’ creative process. They are material traces of the movement of Chremos’ hands, as well as impermanent traces of the movements of the artist’s mind. 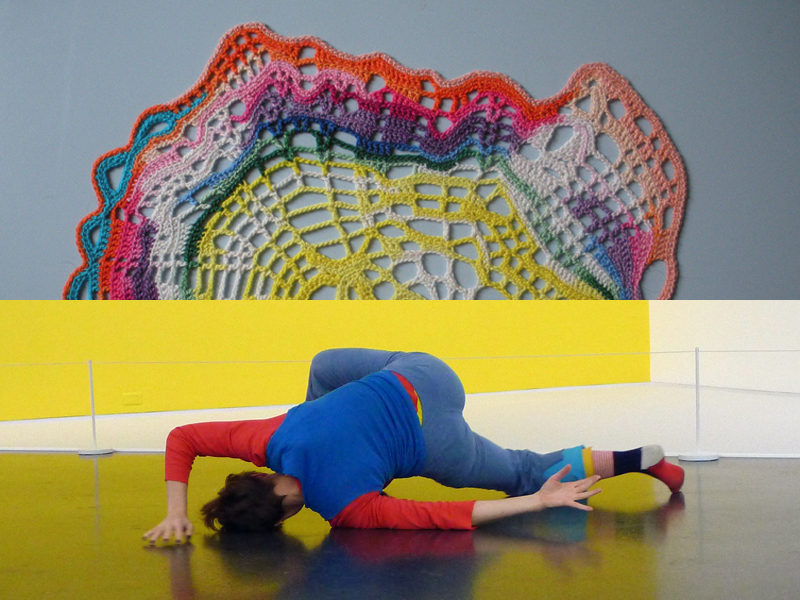 Images, from top: Prismatic, crochet doily photographed by AC; Asimina Chremos in solo performace at the Museum of Contemparary Art, Chicago, photographed by Ruth Lopez. This sense of transience and flowing movement that we find in Chremos’ crochet work is also evident in her work as a dancer, which is likewise grounded in a spirit of improvisation. Chremos has collaborated with musicians who improvise as she dances, creating a synthesis of music and movement that is transient, impermanent and ever-shifting. A spirit of play–what she has referred to as the mischievous “imp” in impermanence–infuses her work, seeking to inspire those most fleeting of feelings, joy and delight. Color, movement, and craft all come together in the work of Asimina Chremos, her doilies creating a joyful dance of thread that is sure to delight viewers. HomeWork will be on view at the Art Alliance from December 10, 2015, until January 3, 2016. Gallery hours are 12PM – 7PM Tuesday through Sunday, closed to the public on Mondays. Categories: Arts, Craft, Exhibitions | Tags: artist spotlight, contemporary craft, crochet | Permalink. 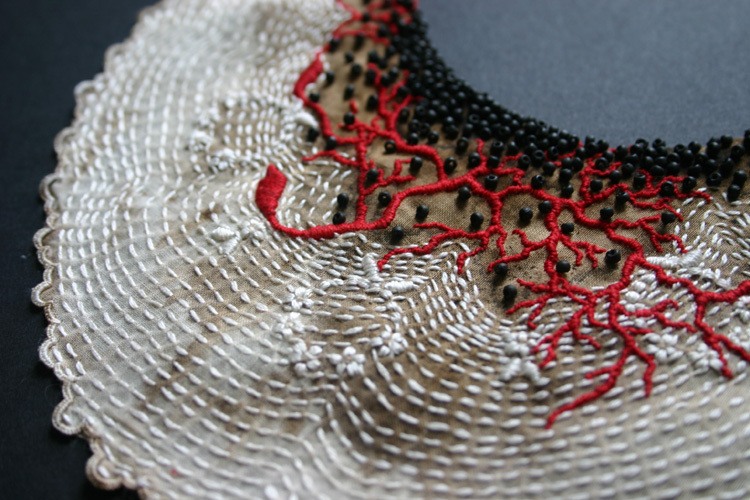 Contemporary textile artist Erin Endicott considers her works a type of drawing, one through which she can best express herself. Walnut ink stains vintage fabric as red, white and brown threads are woven into the cloth. She engages with her works on a psychological level as well. For Endicott, the process-oriented medium she works in is indeed a healing process. J.L.L. 1885-1920. Drawing, hand stitching, walnut ink on antique fabric. Courtesy of Artist’s website. Through her works, Endicott heals her wounds by bringing them to light in visceral forms. She uses vintage fabric passed down by women in her family. Symbolically, her personal history is woven in the fabric that serves as the basis for the following work she performs. She stains the fabric with walnut ink. The ink’s natural flow shapes and tones the “wounds” that the stains represent. Working with this method, Endicott relinquishes control over the outcome of this staining process and trusts the ink’s organic flow completely. 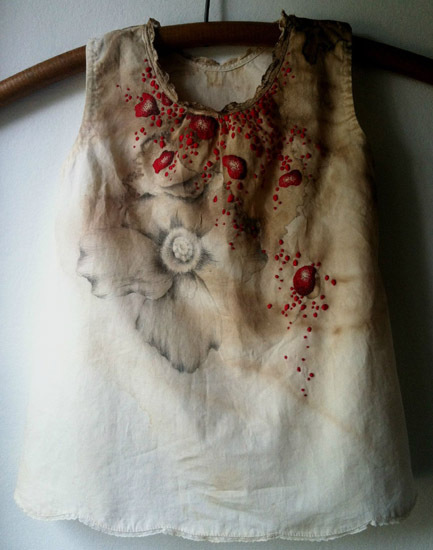 She then stitches over the stained fabric, often in red, white and brown threads. Healing comes through this meditative stitching process for the artist, stitch after stitch, hour after hour. Besides the healing magic in the creation process, Endicott’s works are packed with symbolism of the marks she leaves on the fabric. Growing up in the scenic city Port Republic, New Jersey, the artist often draws her inspiration from the nature. Patterns of veins and roots, as well as shapes of cells and seeds are common themes throughout her works. The various clothing pieces she chooses to work on also serve as a metaphor for one’s skin, conveying a strong sense of intimacy. Born in a family of textile artists, Endicott developed her penchant for this medium quite naturally. She studied textile design in Scotland and received her BFA in textile design at Moore College of Art and Design in Philadelphia. 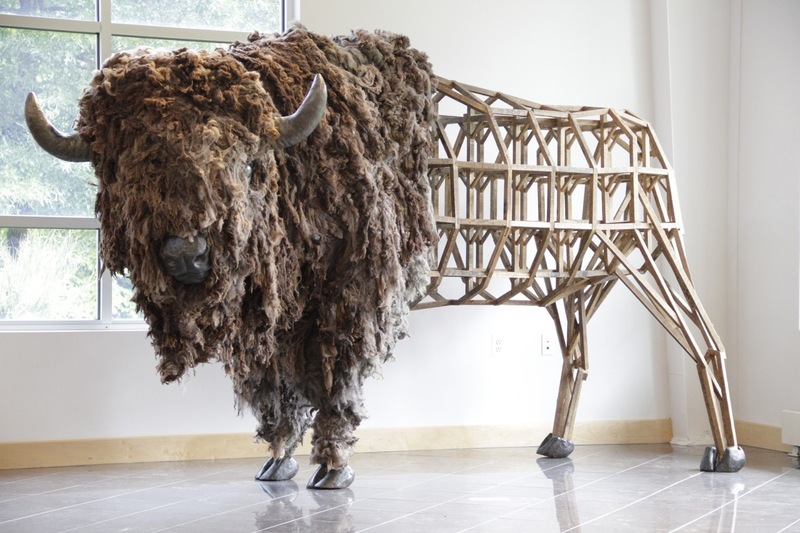 A long-time art teacher, Endicott recently decided to pursue her art career full-time. Her works have been exhibited at museums, galleries and other art organizations worldwide. From December 10 to January 3, Endicott’s newest works will be exhibited at the Philadelphia Art Alliance along with Asimina Chremos’ crochet works in the HomeWork exhibition, guest curated by Alex Stadler. Weaving improvisation into their creation process, these two artists deviate from fiber art’s historical association with domesticity and femininity as suggested by the exhibition title. Categories: Arts, Craft, Exhibitions | Tags: artist spotlight, contemporary craft | Permalink. 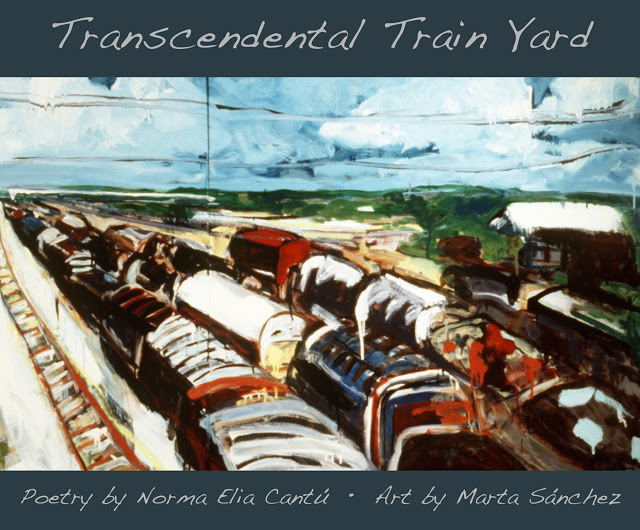 The fruit of an unusual collaboration between visual artist Marta Sánchez and poet Norma Cantú, Transcendental Train Yard is a series of serigraph prints that create a verbal and visual landscape of dreams and memories. Their work occupies borderlands both literal and figurative, between the nations and languages, between the past and the present, between sleeping and waking experience. Sánchez was born in San Antonio, Texas, and is now based in Philadelphia, while Cantú, now based in Kansas City, Missouri, was born in Mexico and raised just across the border in Laredo, Texas. In the process of their long-distance collaboration, these two artists discovered the many resonances in their shared background that come through in the dream-like words and images of these prints. Sánchez has long been fascinated by the train yards near her childhood home in Texas, which were so integral to the local landscape and to her own family history. It was the trains that brought her grandfather, a lion tamer from a circus in Mexico City, to San Antonio, where he met Sánchez’s grandmother. Cantú’s grandfather worked for the railway in San Antonio before the family moved to Mexico. These two artists have moved on parallel tracks, their lives and the lives of their family members crossing borders back and forth to forge a mestizo identity, a rich mixture of cultures and languages. Eight of the ten prints published in the book Transcendental Train Yard are on view on the third floor in the Shanis Programming Space at the Art Alliance from October 25 until November 4. The suite begins with Soledad/Loneliness, which depicts the distinctive landscape of the train yard as seen through a shifting veil of memory and loss, and framed by the body of a woman whose grieving face hovers above the scene like a sorrowful moon as she embraces the figure of an elderly man. 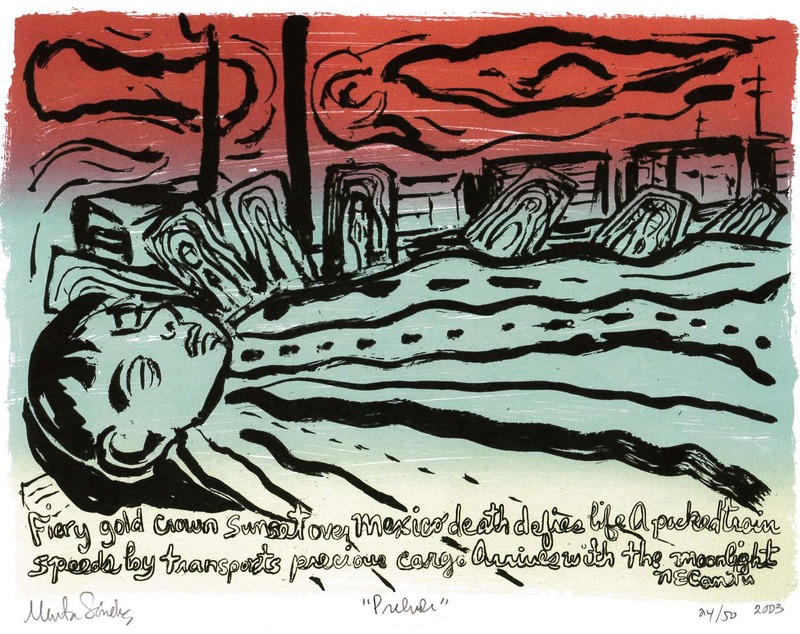 Sánchez’s print responds to the loss of her father, and Cantú’s poem was completed soon after her own father’s passing. The print evokes a shared grief that plays out across the landscape of the train yard, uniting the two women’s experiences and emotions across the distance that separates them. In the pages of the book, these themes are laid out for the viewer in the first print, entitled Prelude/Preludio. A recumbent figure stretches across the composition, with train cars visible in the background as if through a window. It is not clear if he is dead or merely sleeping. The poem speaks of the “fiery gold crown sunset” and the moonlit arrival of trains, but also evokes a struggle between life and death. As Constance Cortez points out, Sánchez’s print recalls Frida Kahlo’s 1937 work, The Deceased Little Dimas, an uncanny painting depicting the body of a deceased child, dressed in a long robe and crown, surrounded by flowers. Rather than looking directly down on the figure with a detached, almost scientific perspective, as we do in Kahlo’s painting, Sánchez shifts the position of the body so that the viewer feels as though she is alongside the boy. Prayer cards with what appears to be the abstracted form of the Virgin Mary surround his bed, watching over him. Strong horizontal lines run along the length of his body, converging on the figure’s head, like the rail tracks of a dream landscape. In this borderland between sleep and wakefulness, between life and death, the train tracks and the rail yard evoke distant places and domestic intimacy, the journey and the arrival. The work of Sánchez and Cantú transforms the heroic landscape of the West, criss-crossed by train tracks and populated by men and machines that are constantly on the move, into a vast and mysterious interior landscape of shared memory and experience. 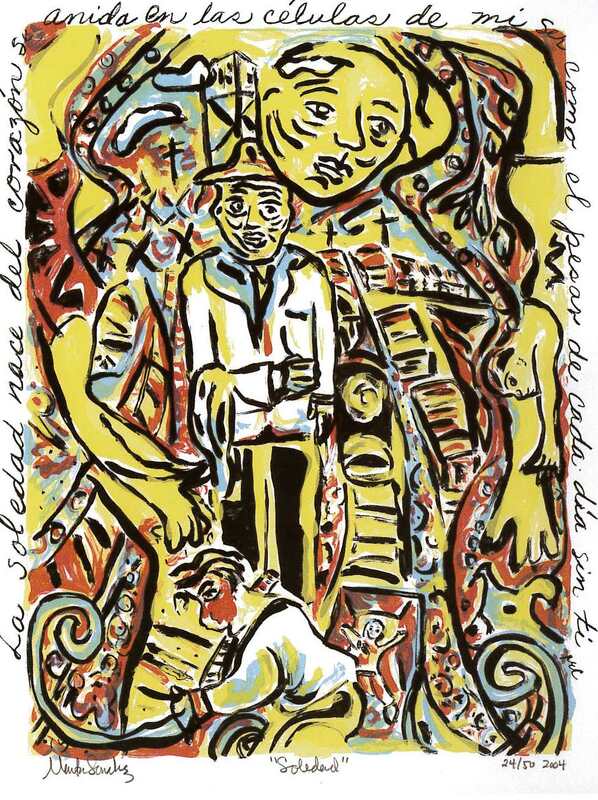 A limited number of signed copies of the book, Transcendental Train Yard: A Collaborative Suite of Serigraphs, art by Marta Sánchez and poetry by Norma E. Cantú (San Antonio: Wings Press, 2015) are available for purchase at the Art Alliance. Categories: Arts, Exhibitions | Tags: art alliance, chicano/chicana art, prints | Permalink.